Time has flown. 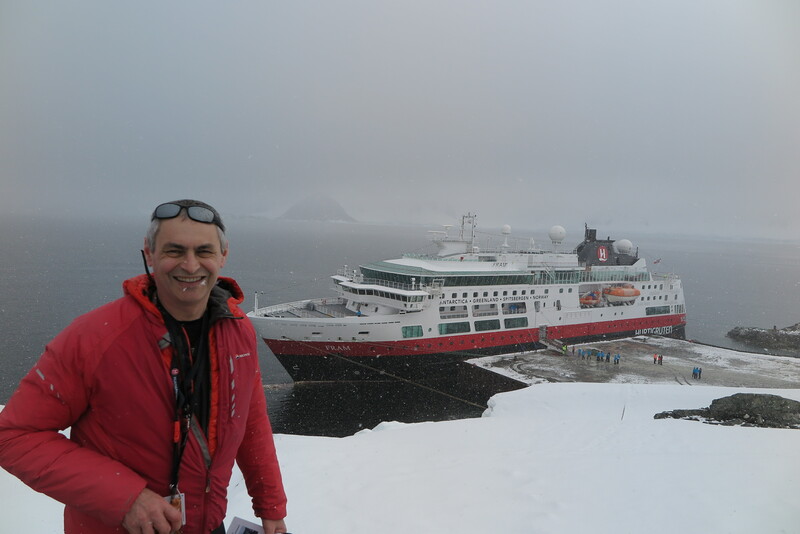 I will be leaving Rothera on the MS FRAM. 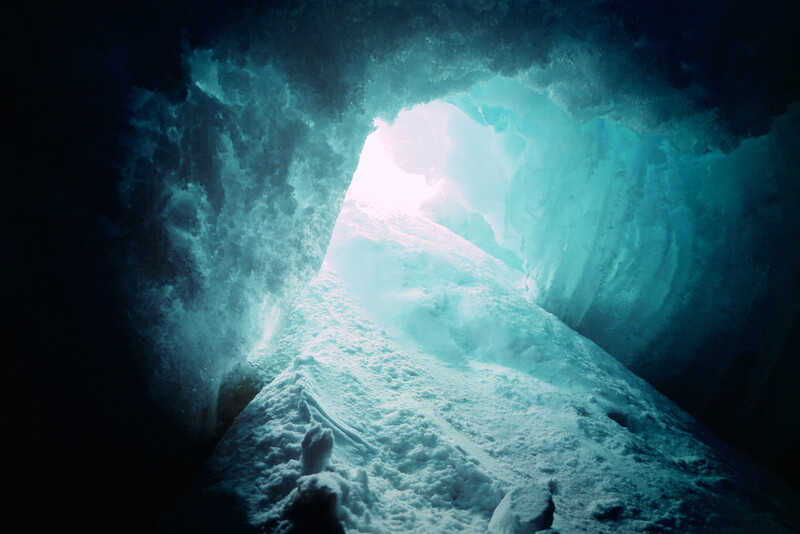 John, the light of my darkness is making a trip on the FRAM and I have managed to hitch a ride back to Ushaia with him. 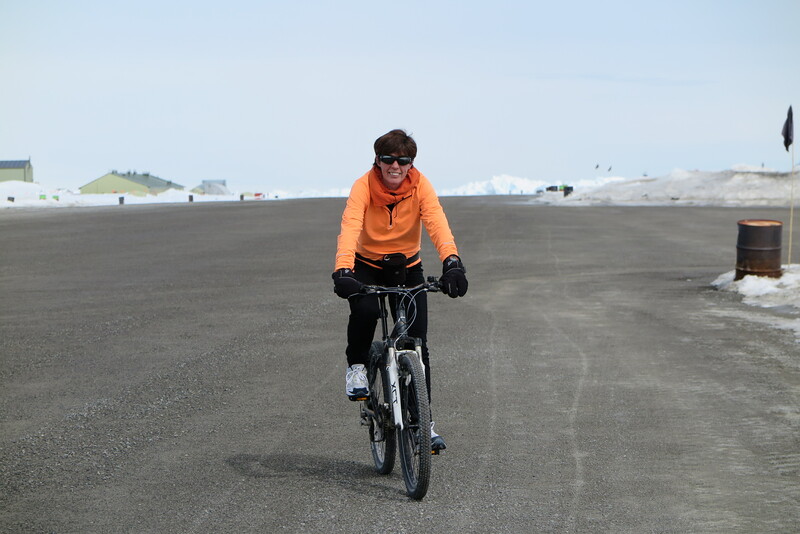 We shall be blogging our next adventure here http://www.crazyguyonabike.com/doc/northamericaminitour . 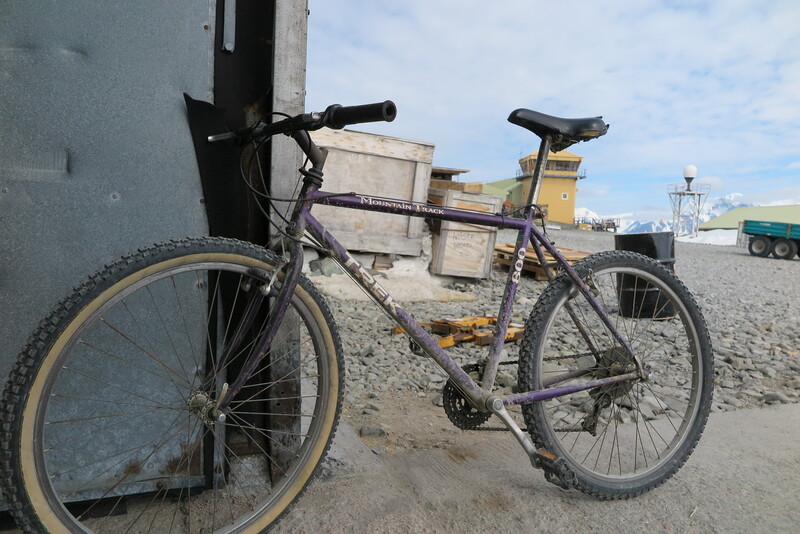 Not sure how they came to be here but Rothera has a few base bicycles. 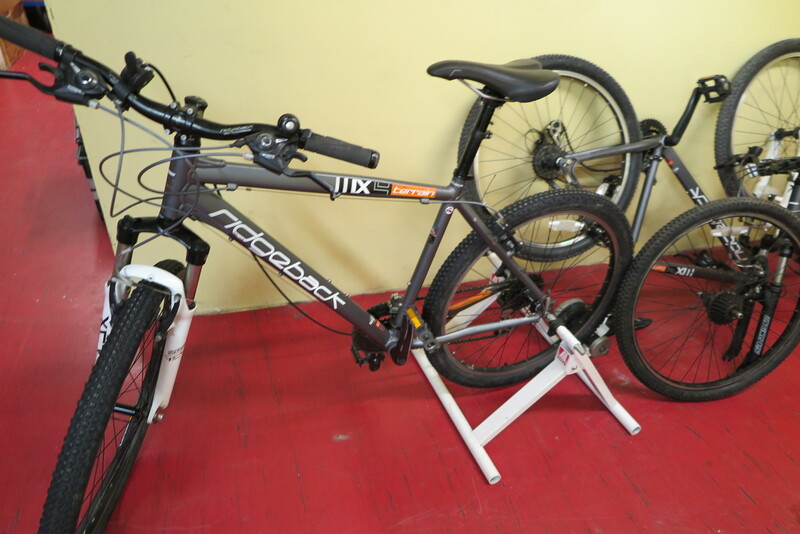 People use them for transport and recreation. 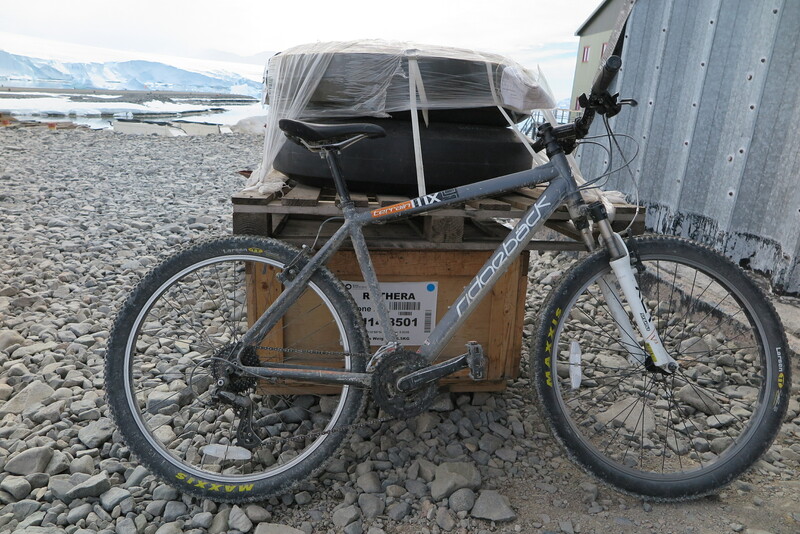 The bikes are also used for transport down to the southern stations and occasionally for the short trip across to the hangar. 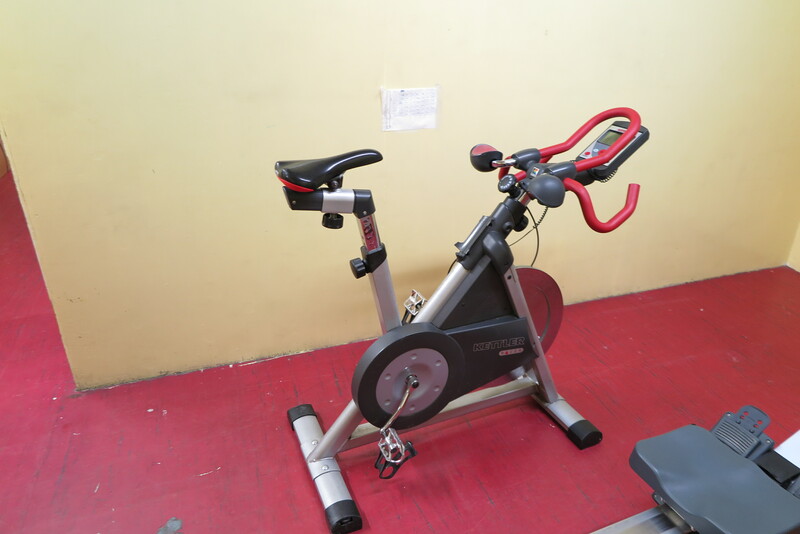 There are also a few options for indoor cycling. 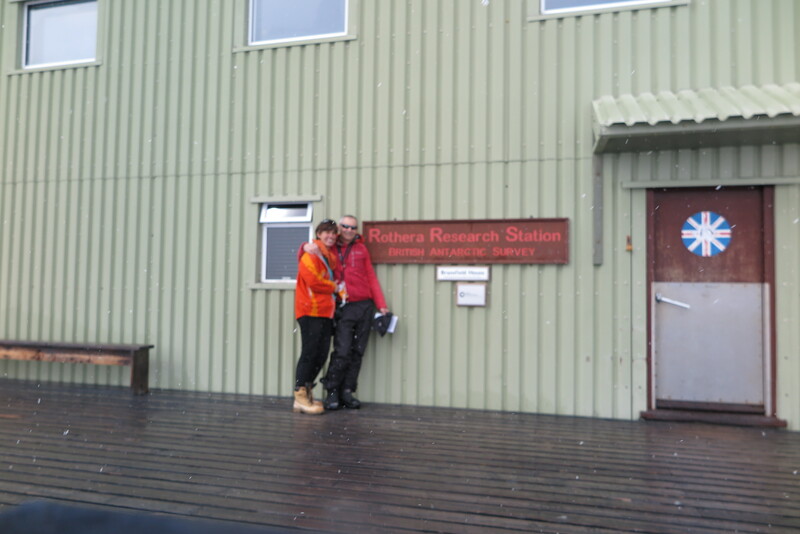 Throughout the summer Fossil Bluff fuel depot/cottage is manned by 2 people out from Rothera on 2 week stints. This is typically one of the Base General Assistants (GAs) and one other random person from base. 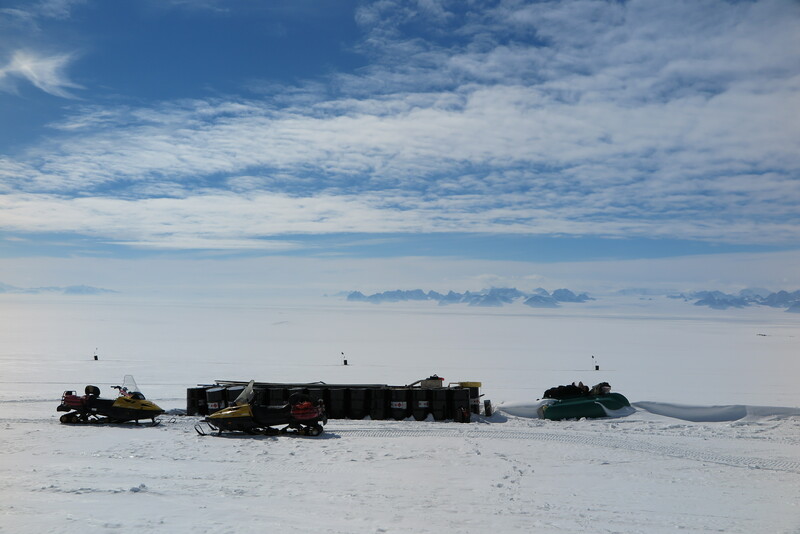 The team at Fossil Bluff do meteorological observations for the incoming aircraft, refuel aircraft and manage the fuel depot. Last week I found my name had come up on the roster. Yipee, Paula (GA) and I would be spending new years at the Bluff. 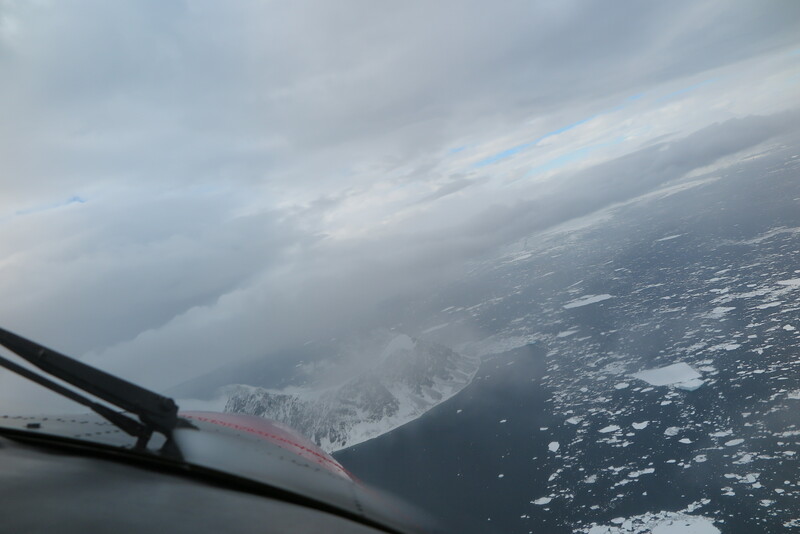 The twotter flight to the Bluff is a spectacular 1 hour and 40 minutes up the King George Sound and the weather was dingle for my flight. 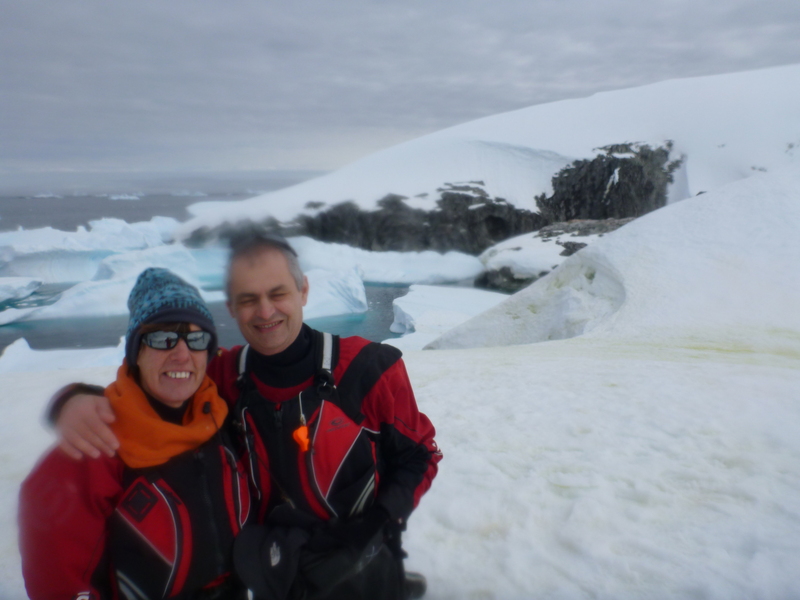 The first day we scampered up the scree slopes to Giza point for views across the sound. On the second day I clawed my way up the steep and scee-ey slope behind the cottage. 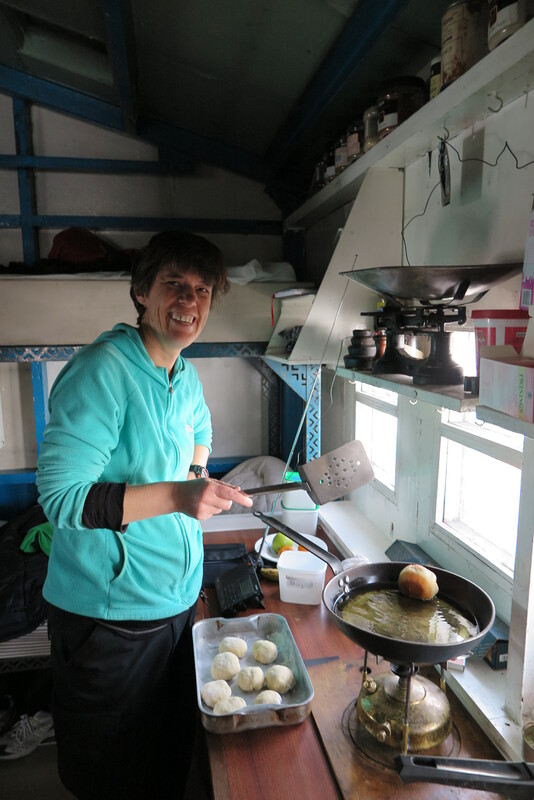 Our baking options were limited by the lack of baking powder and having only a Reflex heater for an oven. 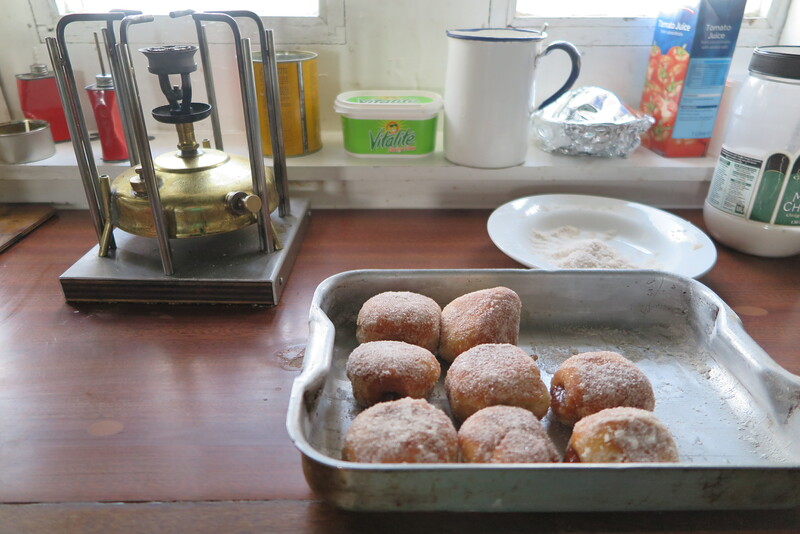 So jammy doughnuts seemed to be the best option. Against the odds they were huge success and we sent boxes of doughnuts out to various field parties on flights stopping for fuel at the Bluff. When the wind was calm and the sunshining the verandah was easily warm enough for a bucket bath and sunbathe. New Years day was perfect weather and no-flying. 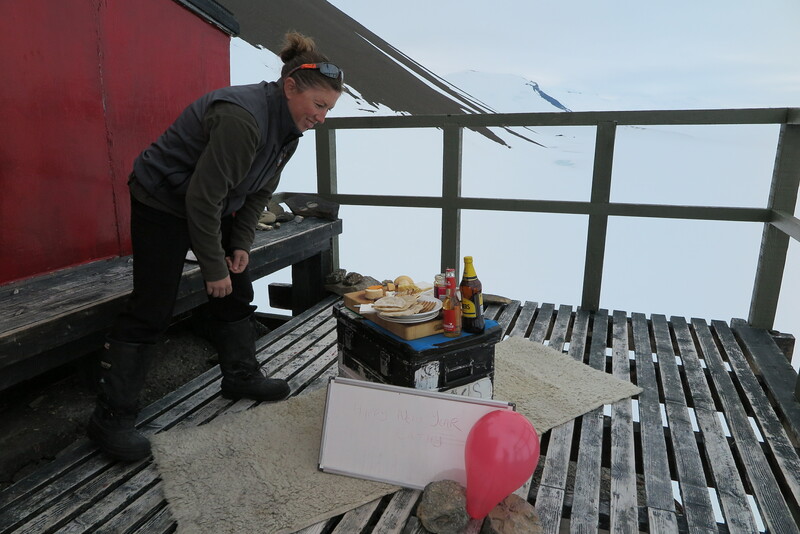 The wonderful Paula prepared a picnic lunch on the verandah. My stay ended all too soon. 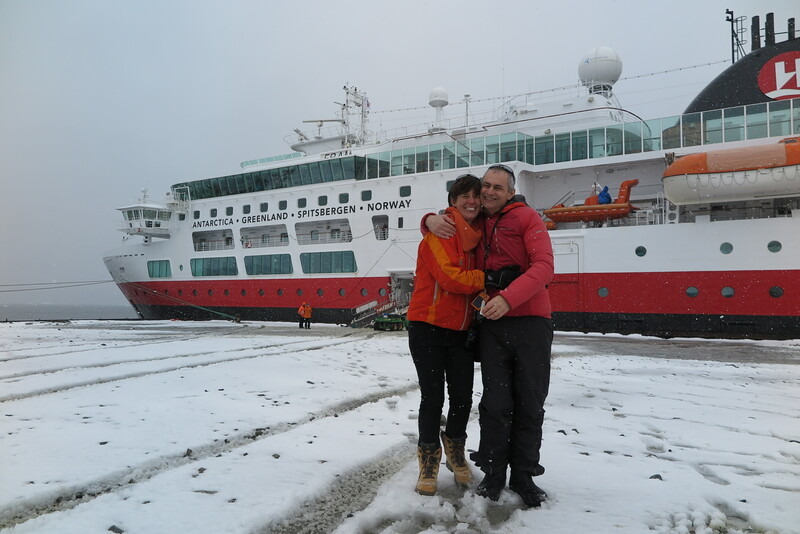 After a fabulous 10 days with the wonderful Paula I boarded the Twotter flight back to Rothera for a proper shower. 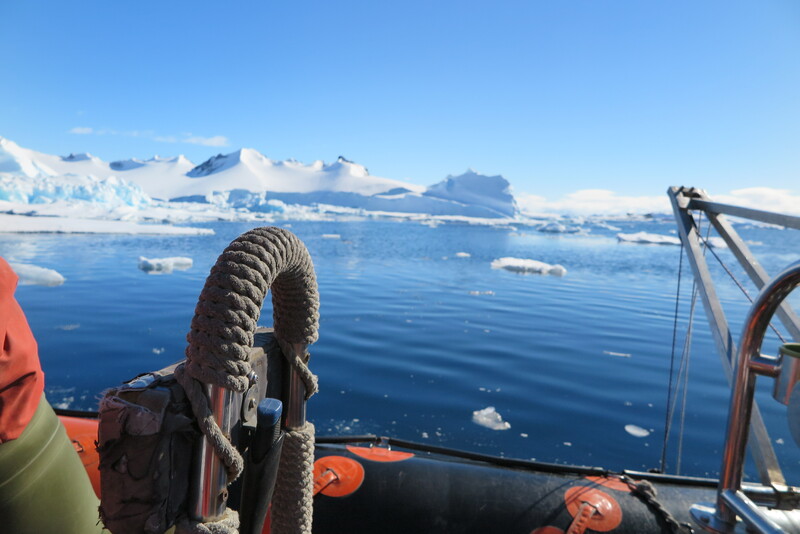 This week I got out on one of the science boats Nimrod. 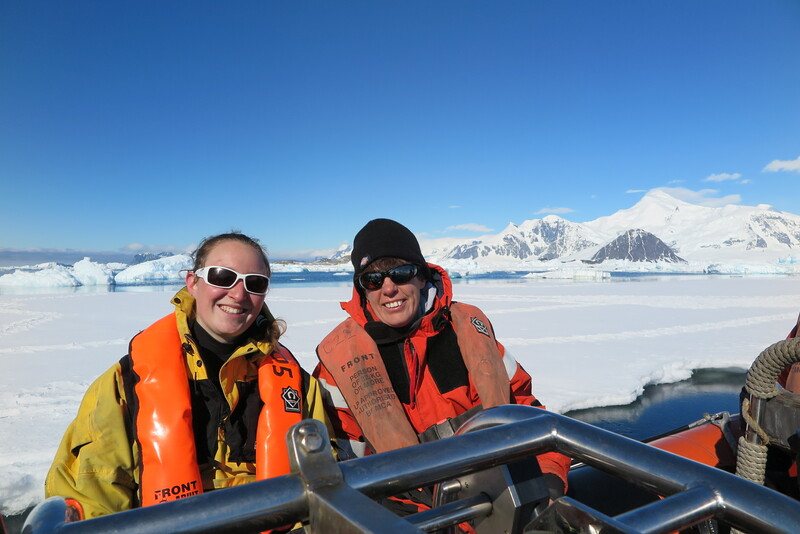 The marine team at the Bonner Laboratory at the southern end of the base make regular boating/diving trips in the local area to take water samples and to lower a Conductivity, Temperature and Depth(CTD) instrument. On a morning off I tagged along on a trip into South Cove. 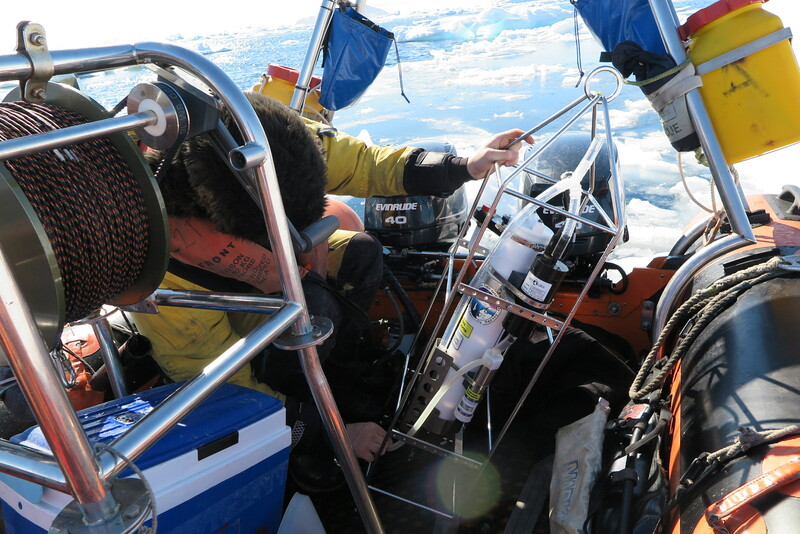 The CTD Instrument is lowered to as much as 500 metres then hand winched back onto the boat. 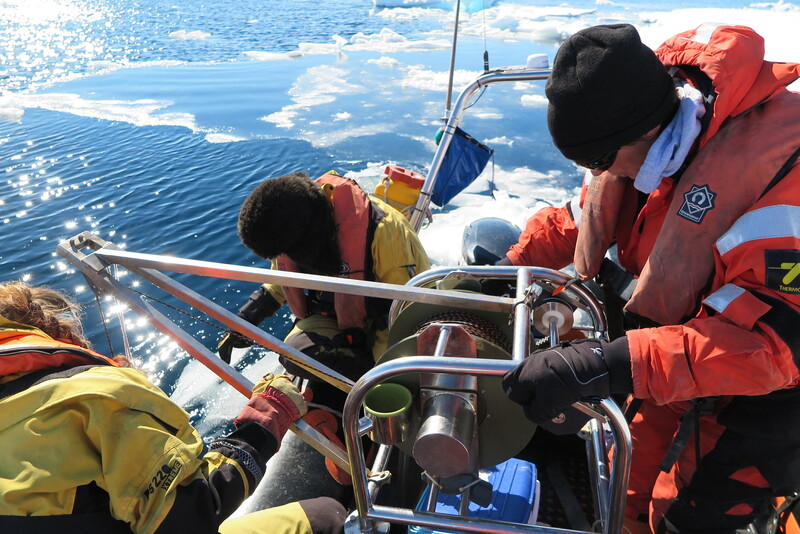 Winching up the CTD instrument. 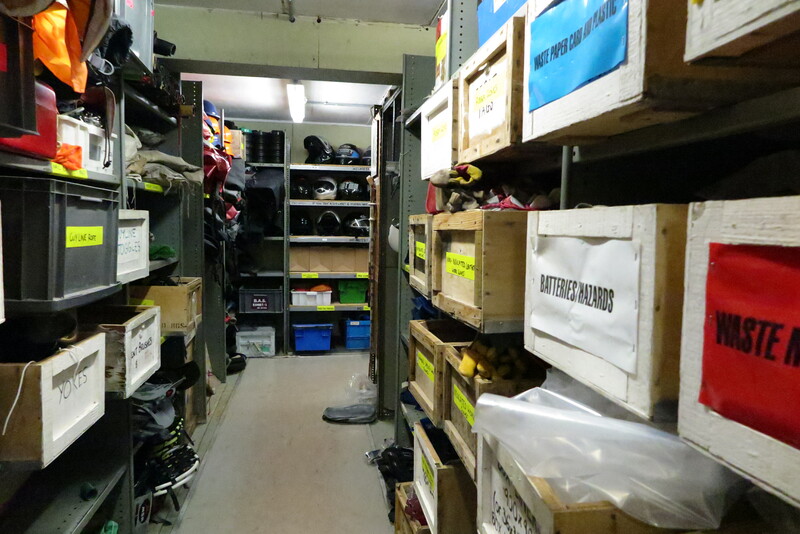 We also took a number of water samples from 15 metre depth into ultra -clean containers for analysis back at the lab. The daily update of the info-screen in the dining hall which shows the co-piloting assignments for the next days twin otter flights is almost as interesting as finding out what the chefs have cooked for dessert. 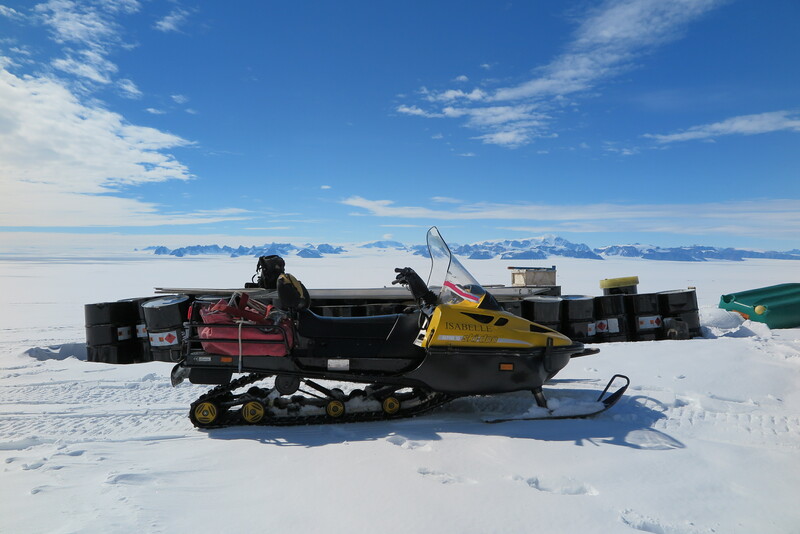 Yesterday was my day off and my name appeared as co-pilot for a trip out to pickup a load from the Larsen ice shelf Sledge Quebec field party. Woohoo. 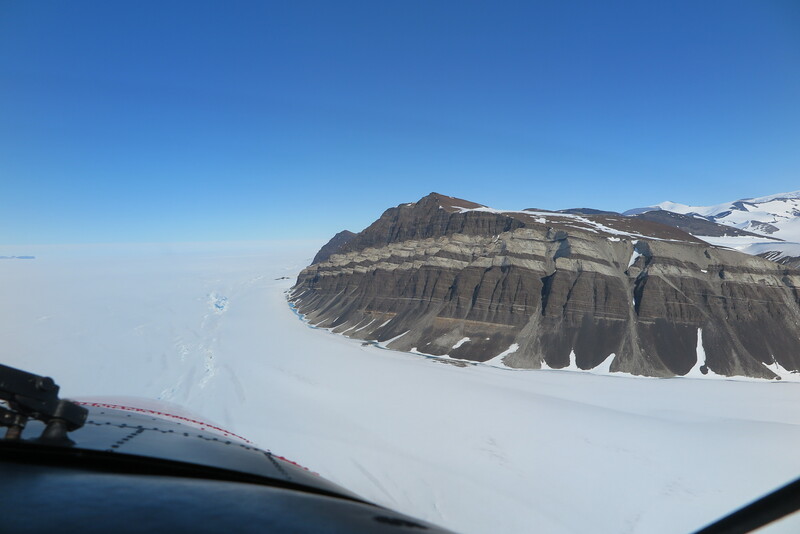 After a morning of waiting for the weather to clear here at Rothera we left in the early afternoon for the one hour flight Eastward across the peninsula to the Ice shelf. 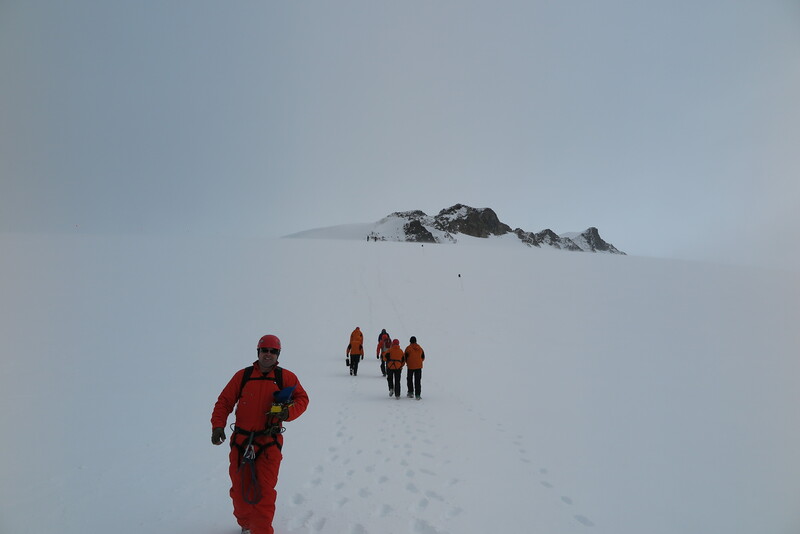 We rather rapidly climbed to 12,000 feet to be sure we would clear all the peaks on the peninsular. 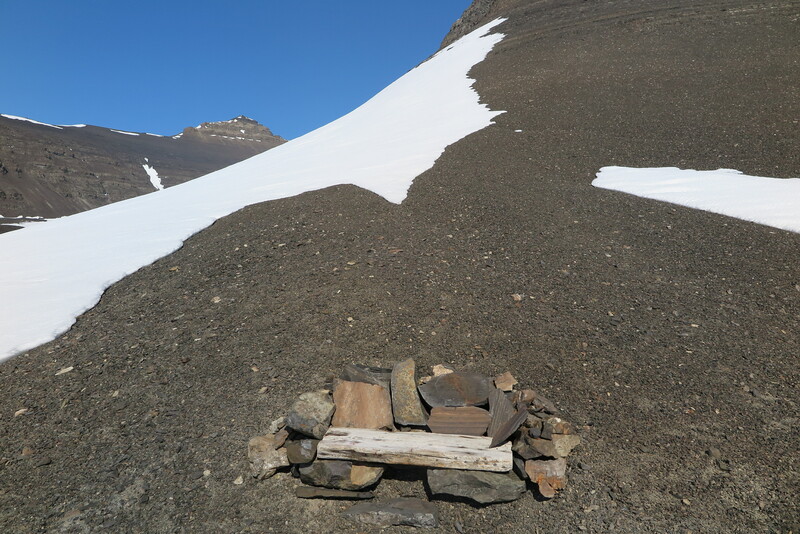 At the camp site the Sledge Quebec team had laid out and flag poled a skiway at their camp. 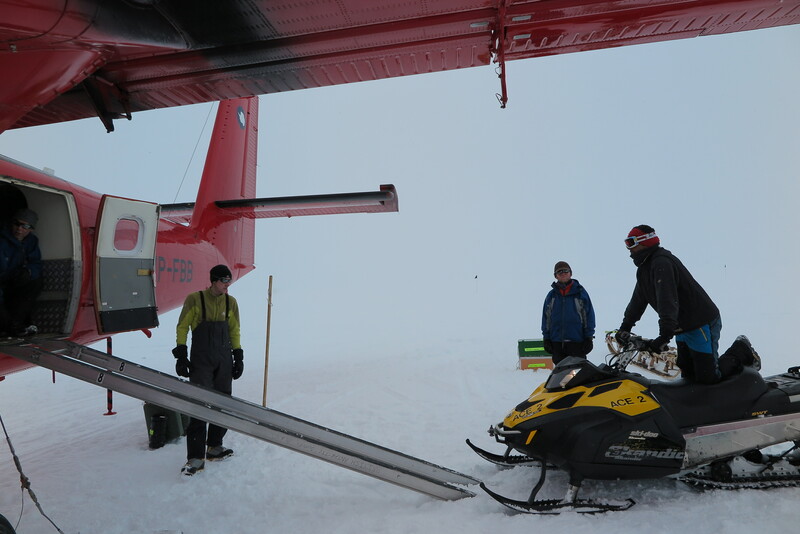 We were the 4th of 6 flight loads requiredto pickup the project team, science kit and 4 skidoos. 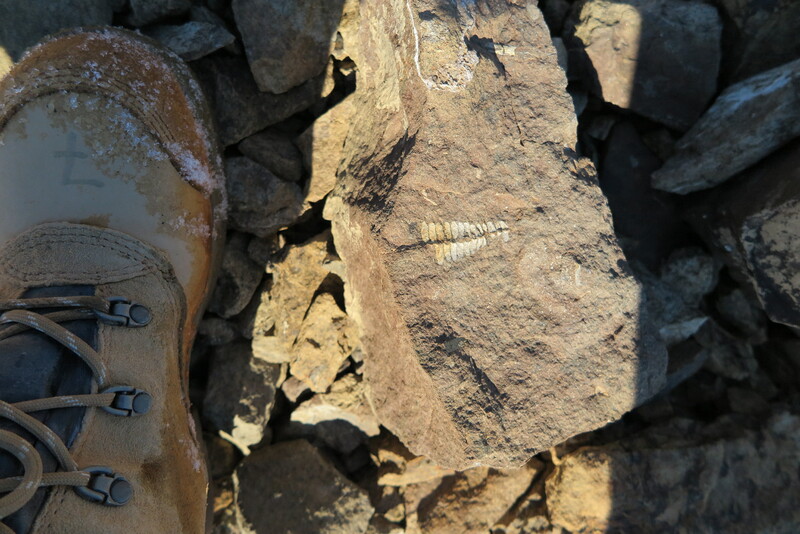 It was fabulous to see a real-life field camp. 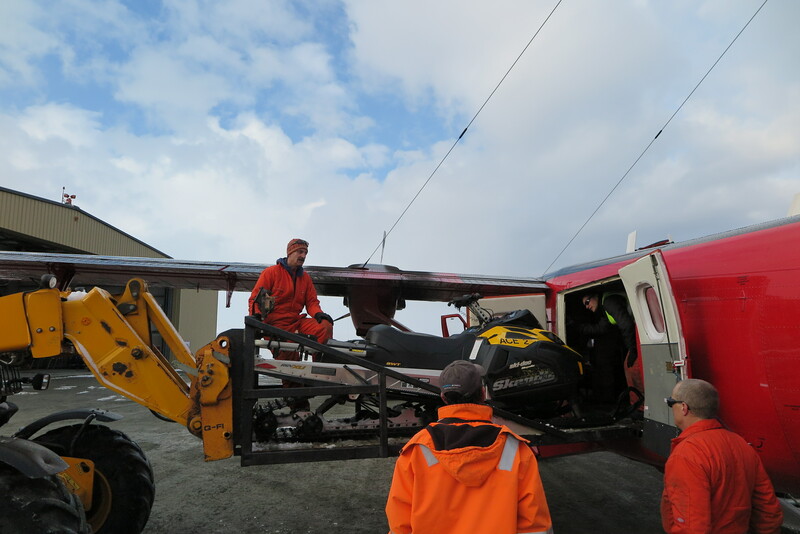 It took us about an hour to load one skidoo and a thousand pounds or so of stuff and two scientist onto the twin otter. I came across a curious looking instrument on my walk up to the Point yesterday and did some investigating to find out what it is. It turns out to be a cloud height measurer. The instrument like many others had a connection coming back to Old Bransfield House. 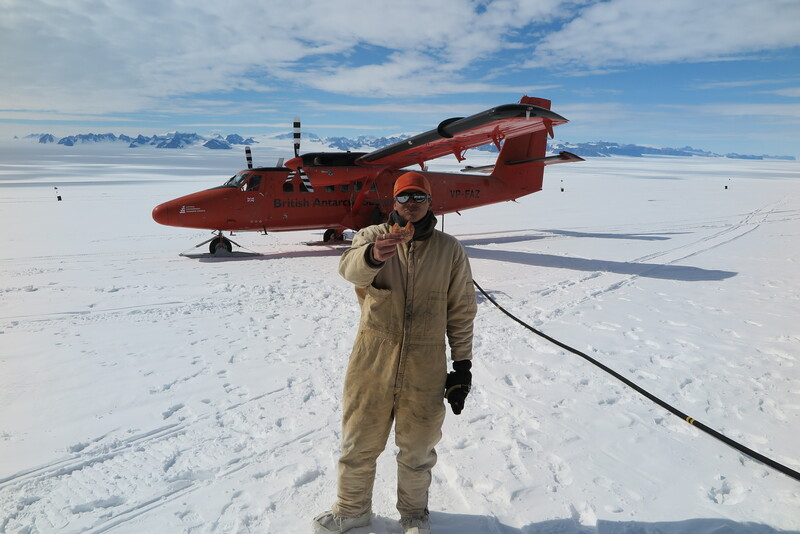 The aircraft meteorology observations require cloud height measurements. This is quite an art requiring an experienced observer. 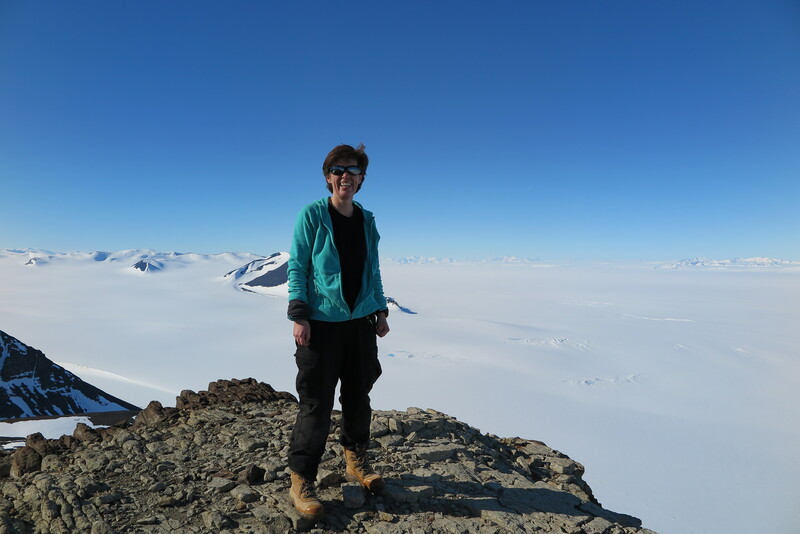 At Rothera the cloud heights are provided through visual observations by the Met babes. They do however have this clever instrument to help them. 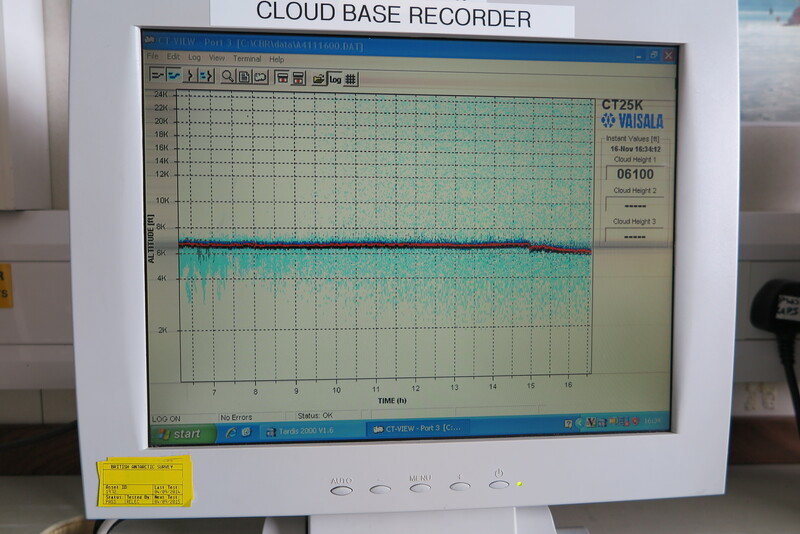 This instrument fires a beam into the sky and determines the height of the of the base of the cloud be the time recording the time for the signal to bounce back. 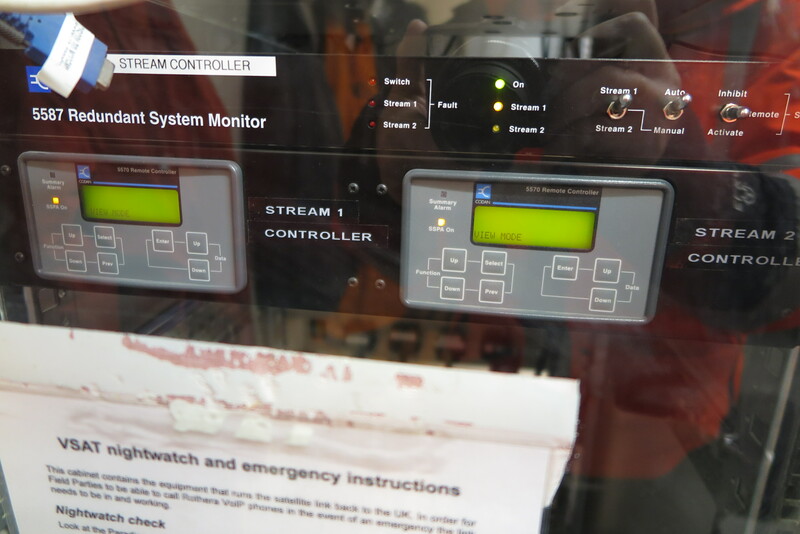 This is displayed on a terminal in the Met Office and observers can VNC connect to the server to view the display from anywhere on station. 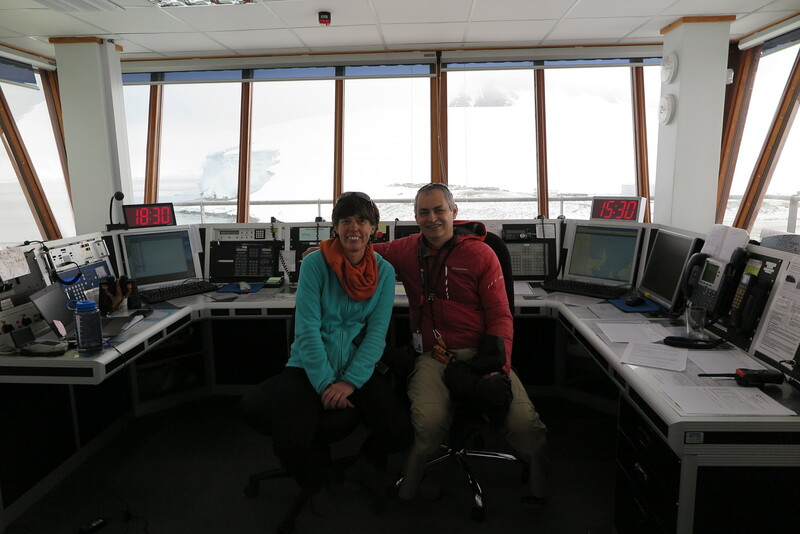 A big part of the job in the tower is passing meteorological observation to aircraft. Whenever BAS aircraft are flying we collect and pass hourly weather observations for all airfields along the planned and alternative routes for the flight. These help the pilot decide whether to continue with the flight as planned, what altitude to fly at, what find of approach to make when landing. And probably other flying decisions that I don’t know about. 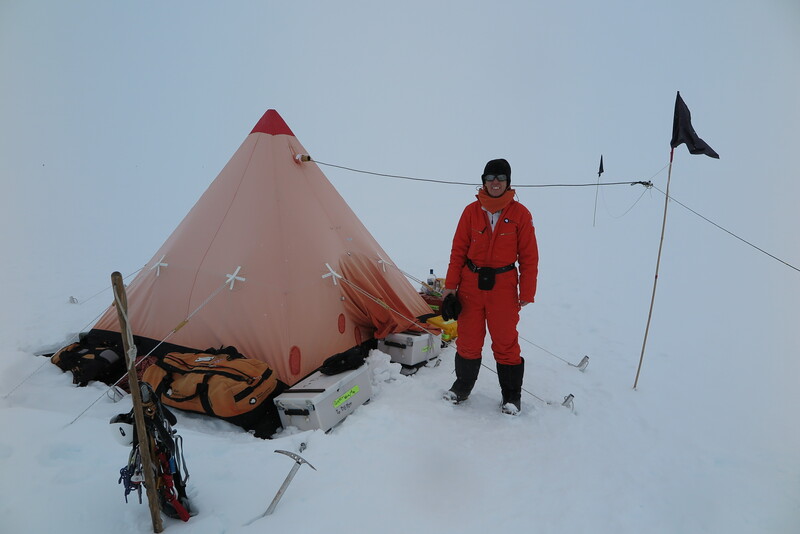 The observation reports typically include, wind speed and direction, contrast, horizontal definition, cloud coverage and heights, temperature/dew-point, present weather, barometric pressure and observer comments. The content is similar, however there are some subtle difference. In the BAS observations wind directions are given as magnetic bearings where METARs give wind directions in true. 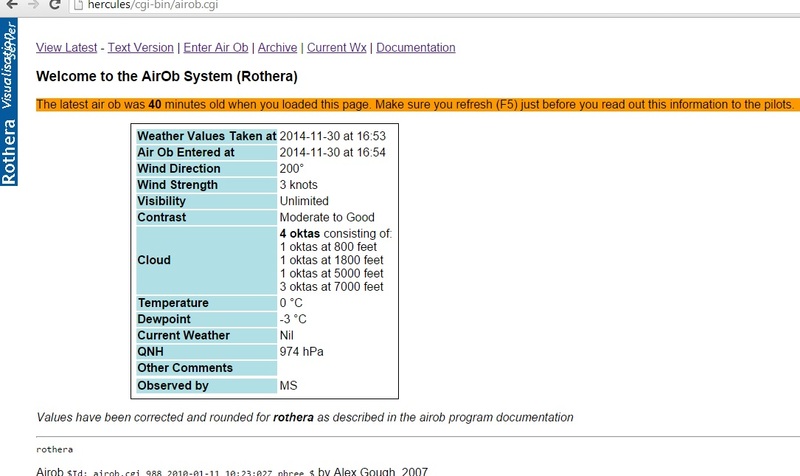 The cloud coverage is reported in oktas (eighths) in the BAS observation while a METAR uses scattered, broken or few terminology. 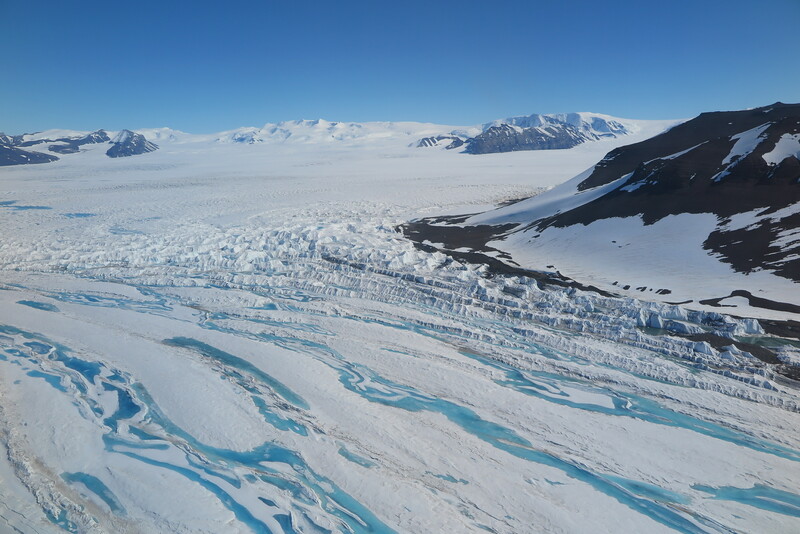 And the BAS observations include an indication of the contrast and the horizontal definition which are particularly relevant to polar flying. 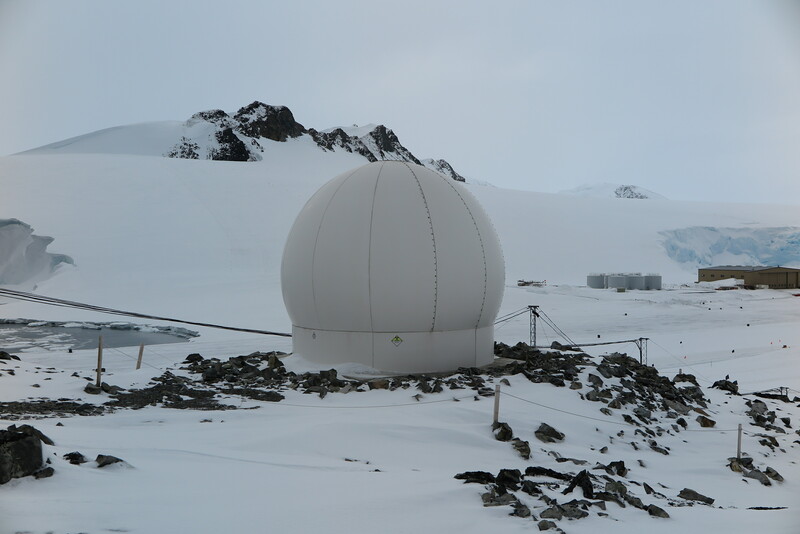 Hourly Met Observations are taken at Rothera, Fossil Bluff and Sky Blu. 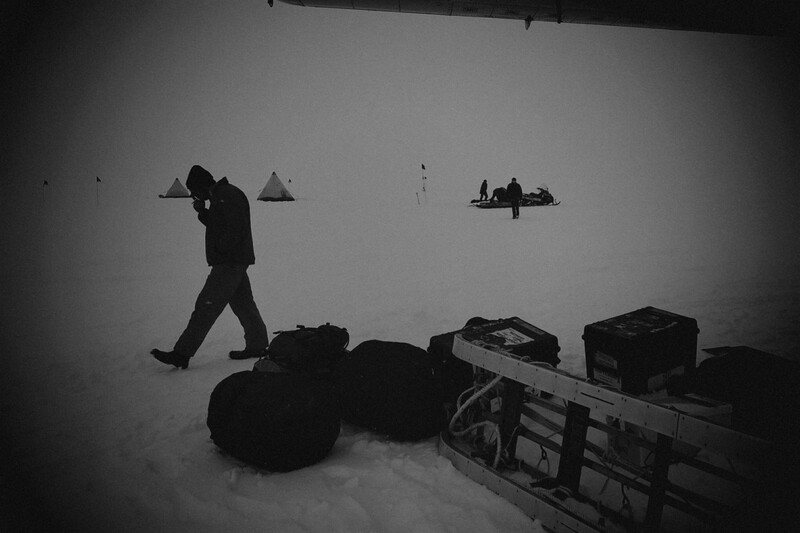 The first observation is taken at 700am (1000 zulu). 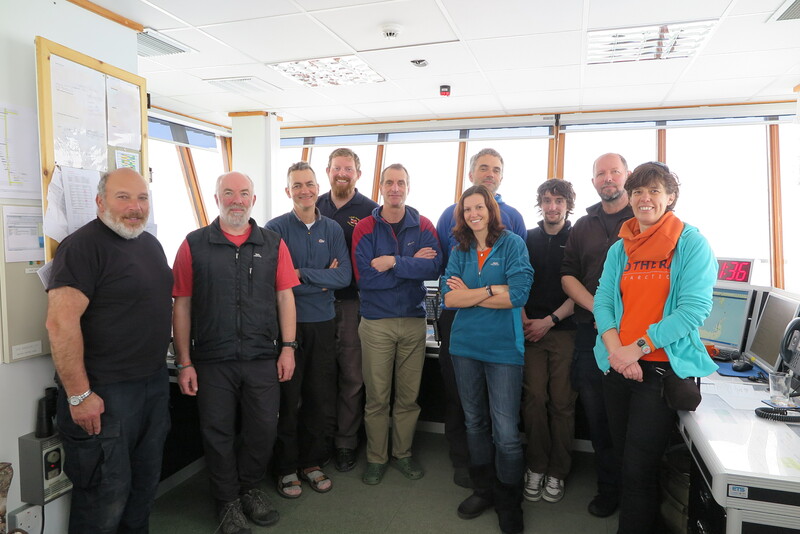 The Fossil Bluff and Sky Blu observations are taken on the HF radio and the Rothera observation we can get from the local intranet. The BAS observations are mostly passed to flights heading south to deep field locations. This is an international standard for aviation meteorological observations. 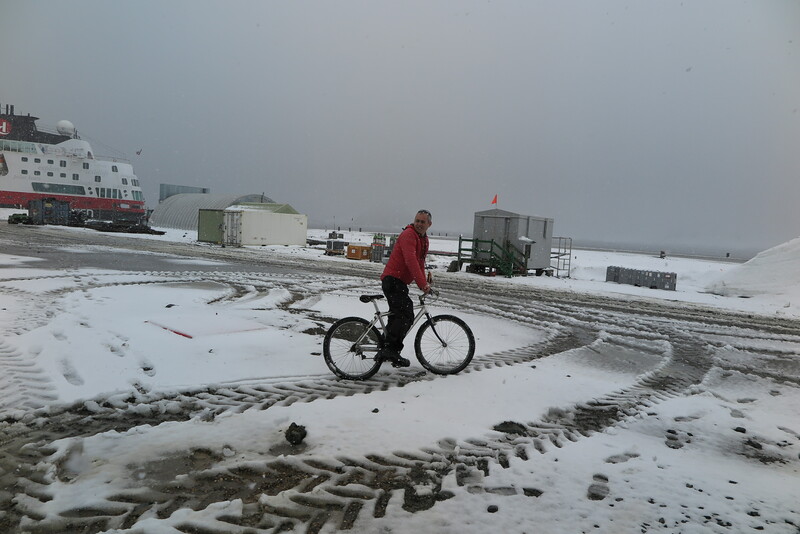 The airfields at Punta Arenas, Marsh and Mount Pleasant in the Faulkland Islands all provide hourly met observations in this format. 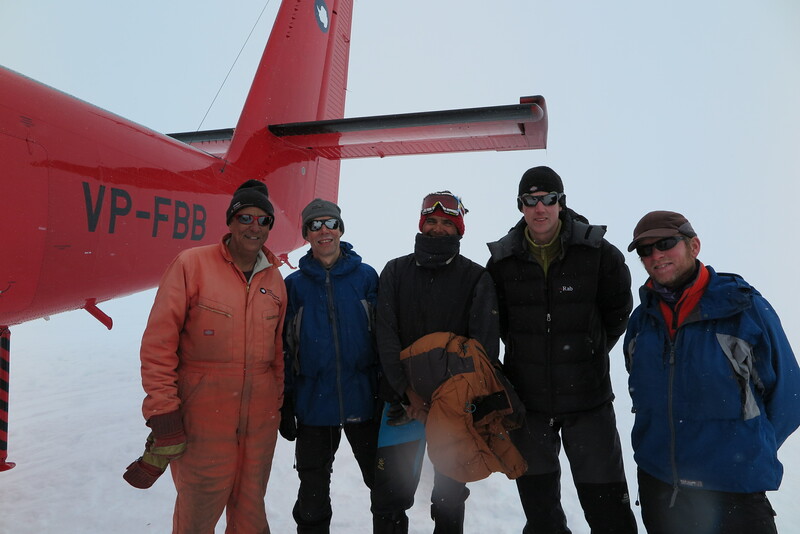 These observations are typically passed to flights heading North to Chile or Faulkland Islands. 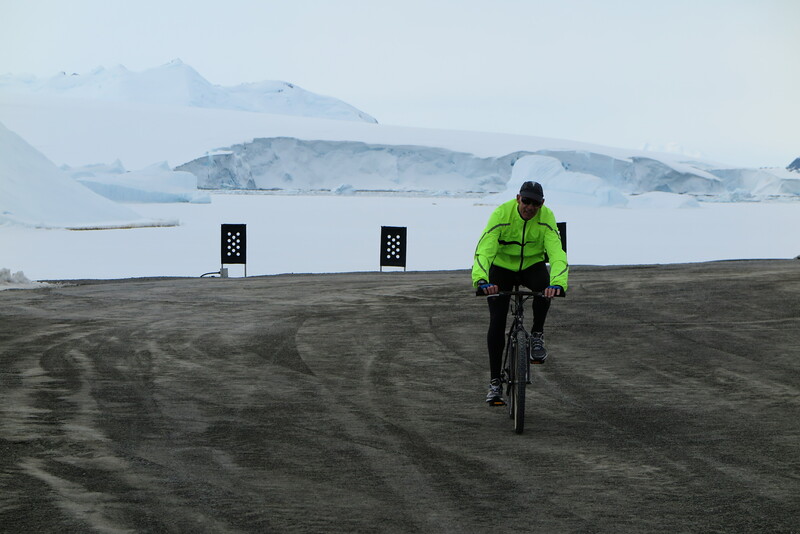 Internet bandwidth at Antarctic latitudes is very expensive. Obviously there aren’t any broadband fibre cables so satellite internet is the only option. And there are only a limited number of satellites that attempt to provide coverage this far south. 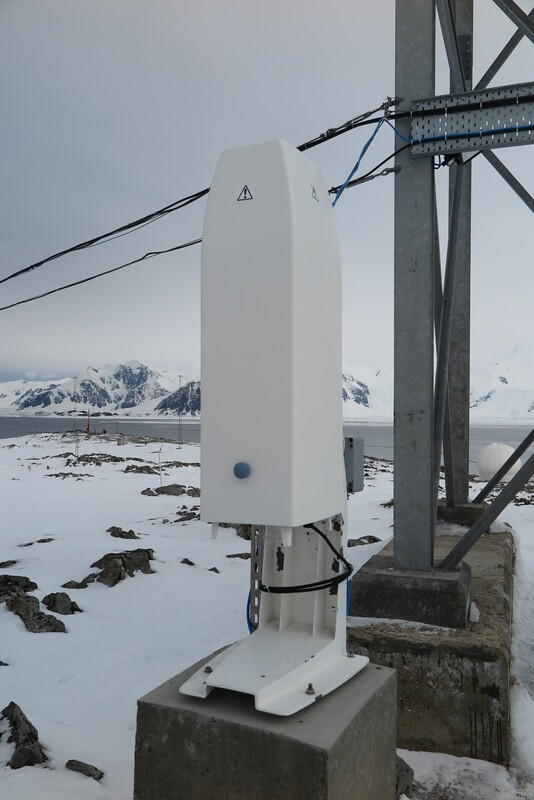 Rothera station has a 2.4m VSAT dish stored inside a radome sitting on the point just behind the base. The dish talks to the NSS-7 satellite which is a geostationary communications satellite, located in the sky at 0°0′N 20°00′W. To point the dish antennae at the equator the dish points at a dis-concertedly shallow angle. So low, that if work is required on the roof of one of the station buildings the dish must stop transmitting. 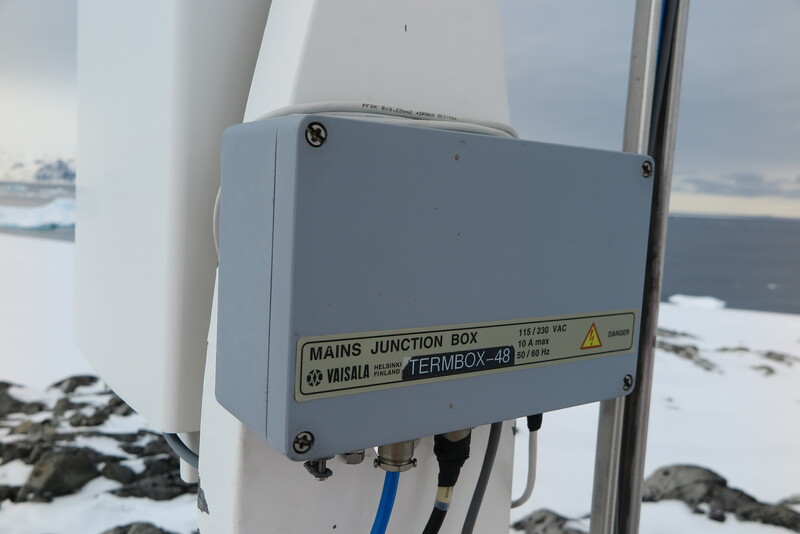 This shallow angle also means that the signal has to penetrate a lot of weather as it glances through the atmosphere for a significant distance. This means that snow and precipitation thousands of miles away from the base can significantly impacts on the service. And it frequently does. The station telephony system is a Cisco VOIP system that uses the internet connection to carry the incoming and outgoing telephone messages. So outages cause a disruption to both the internet and telephone system. 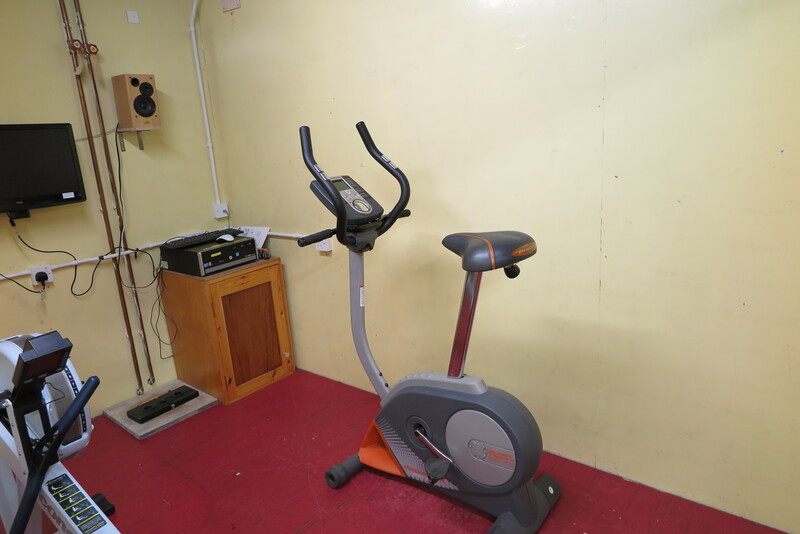 Because field parties may try to telephone the station at any time of the night the status of the link is monitored 24/7 by the night watch person. If the link fails in the middle of the night the night watch person will wake up the communications manager. 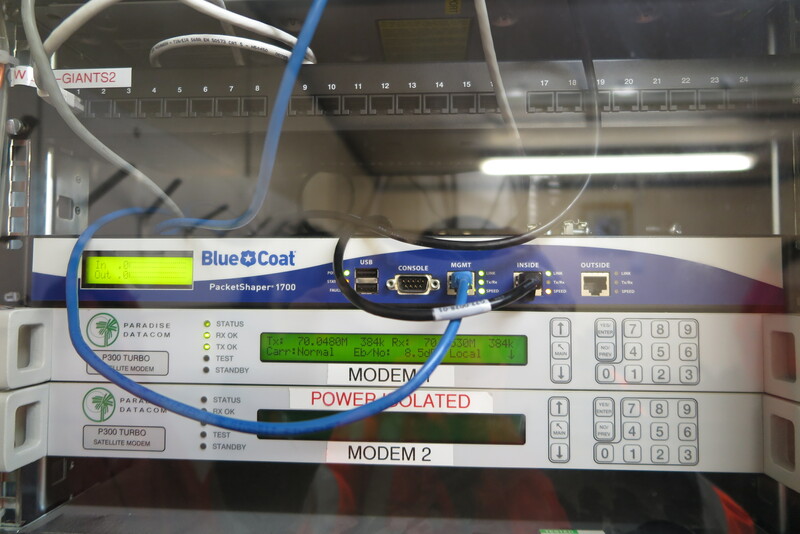 The modem and codan equipment to modulate the satellite signal sits in a cabinet in the boot room of the Giants accommodation building. 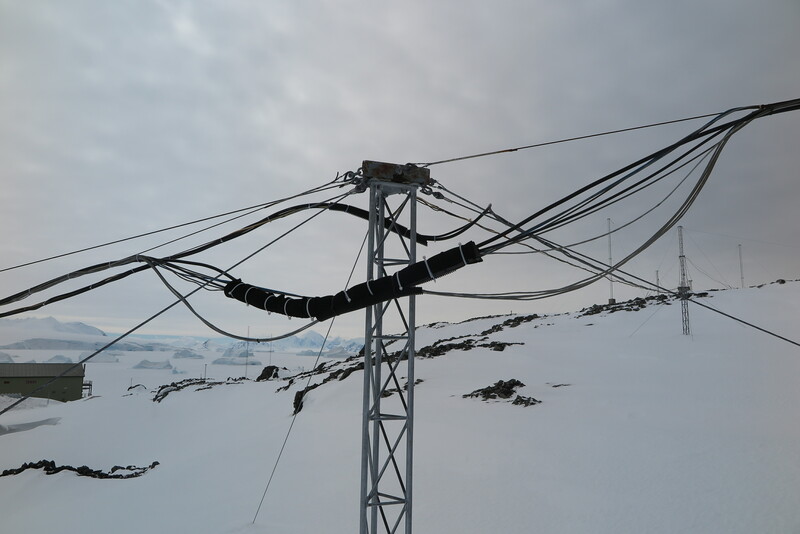 These manage the traffic and the antennae. 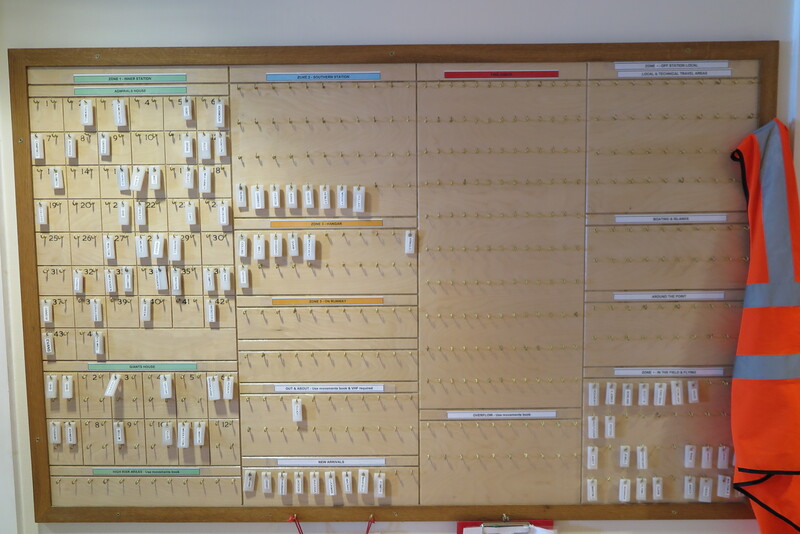 The whiteboard in the dining hall at Rothera is always spattered with offers for opportunities to participate in boating, skiing, mountaineering, walking etc. Yesterday this list went up for visits to the show crevasse. I had heard from others that this was a must-not-miss trip. I managed to get my name at the top of the list. 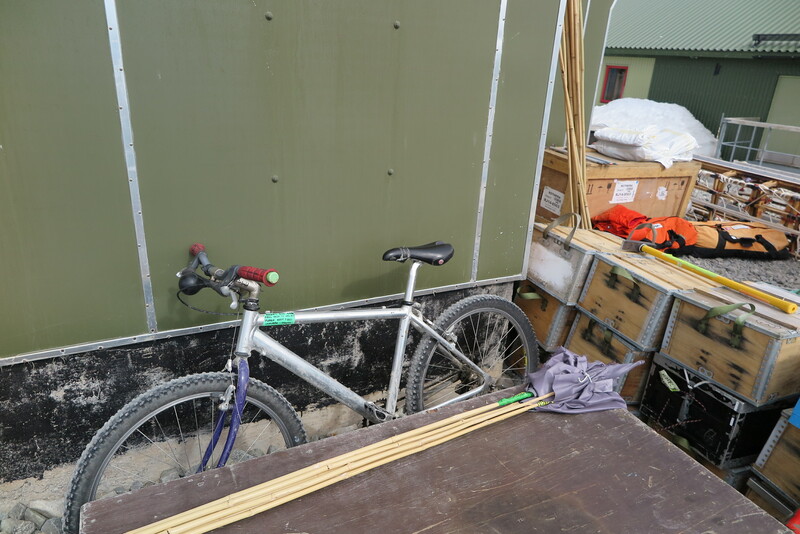 So at 1.30pm after Sunday brunch, myself Matt (mechanic), Sam (electronics engineer), Nick (domestic), Seb, Izzy and Becky (i-Star scientists) assembled at Fooks house to kit out in boots, cramp-ons, helmets and harnesses. 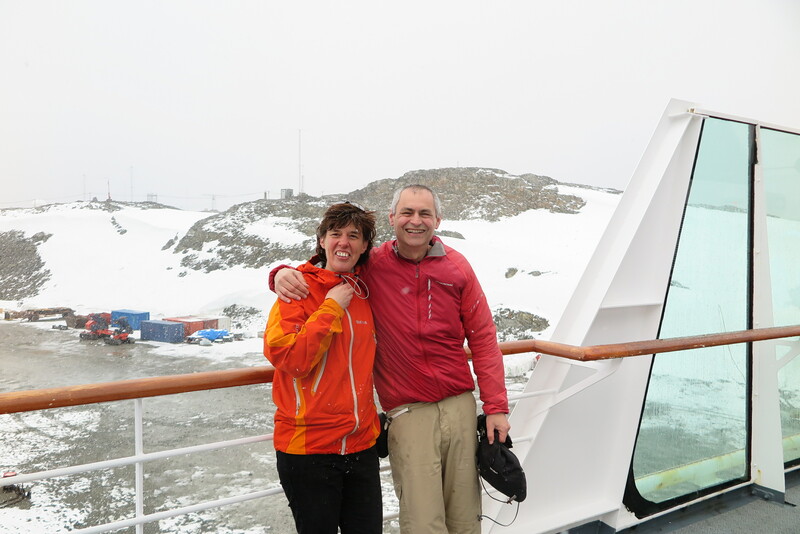 The trip was generously guided by the fabulous Senior Field Assistant Roger Stiltwell. 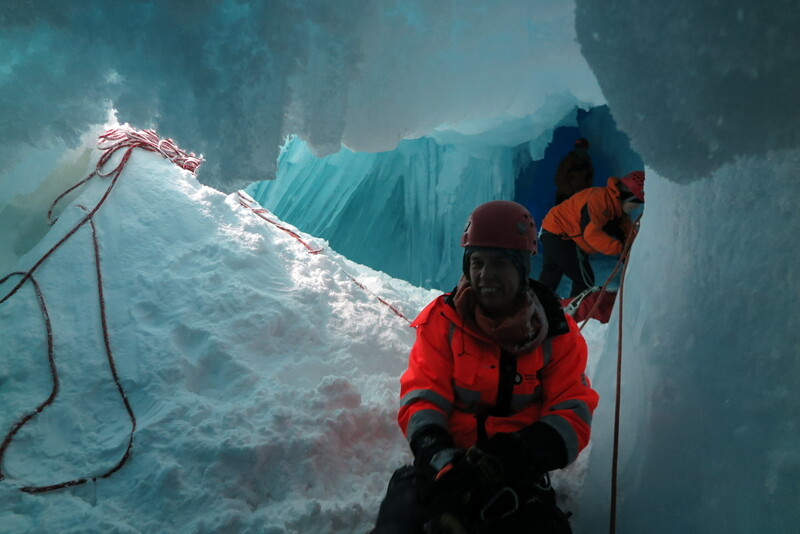 After helping us all fit our cramp-ons and harnesses, Roger went ahead to dig out the crevasse entrance and Sam led us up the ramp to the crevasse entrance. 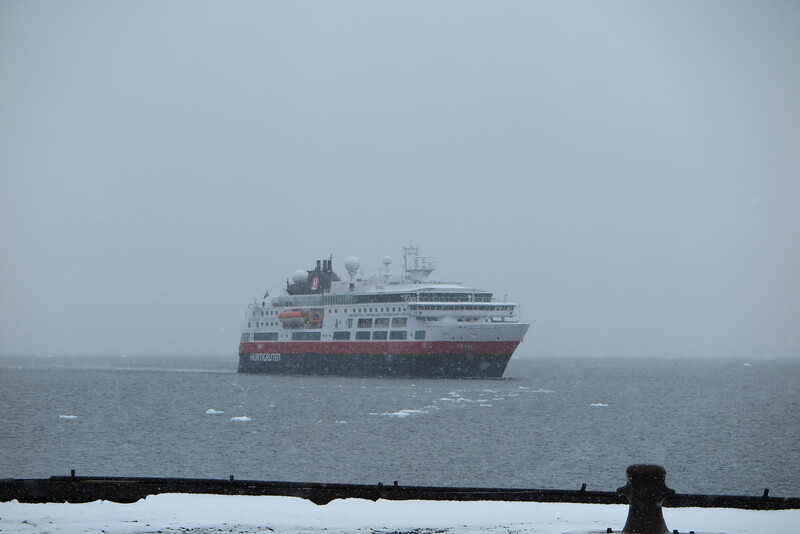 The weather deteriorated slightly as we walked up the ramp. 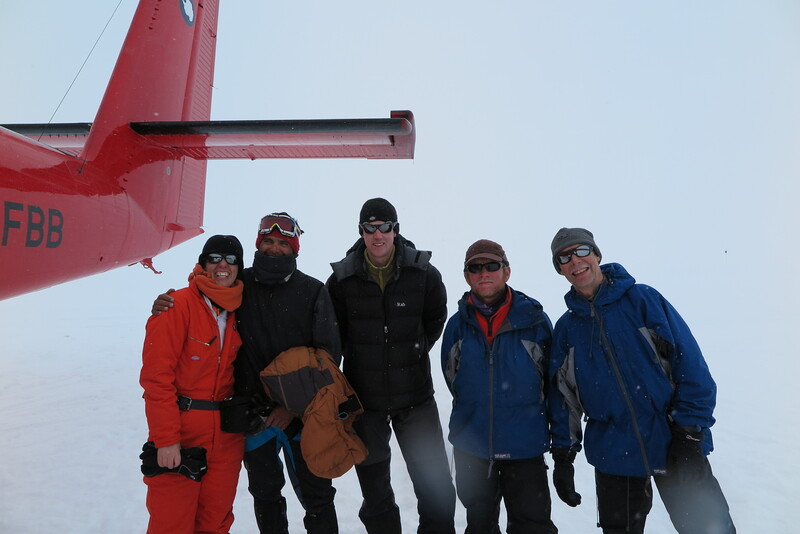 We stopped at the top to watch the Dash 7 land on the base runway bringing 12 more new summer crew. 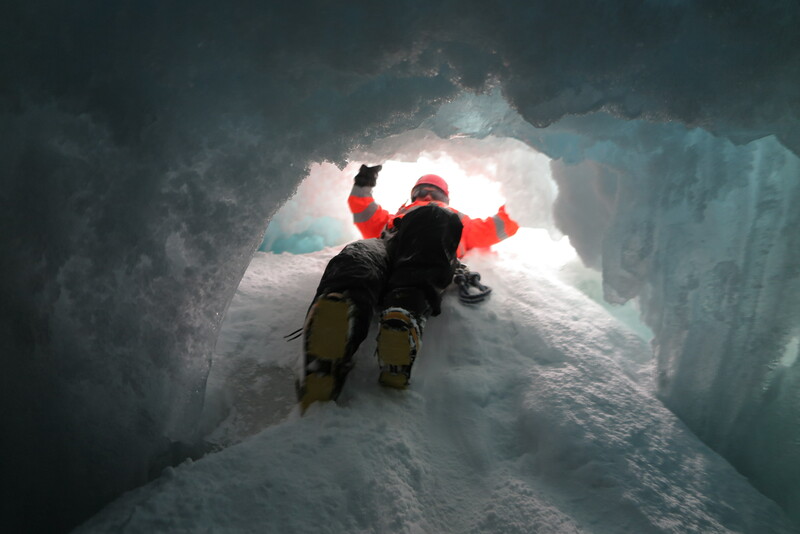 At the entrance to the crevasse Roger attached a rope to the bumper of the parked skidoo and belayed us all down the narrow entrance into the crevasse. 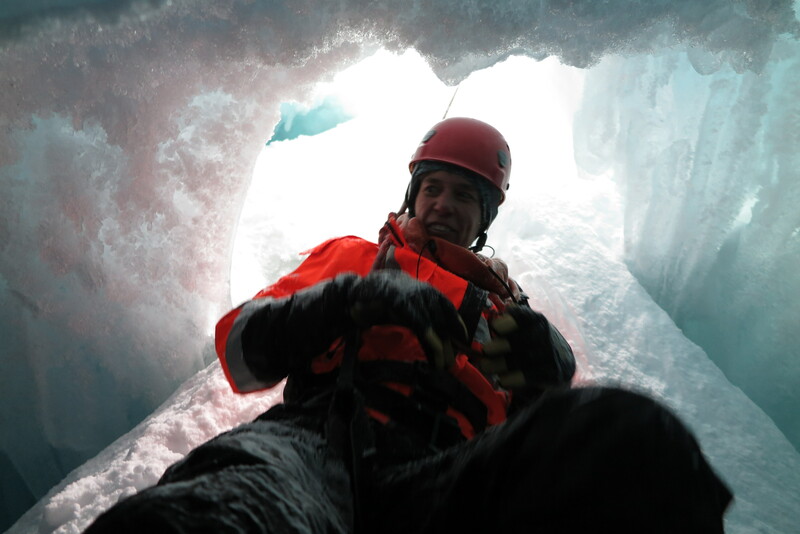 Sam meet us at the bottom of the descent and unclipped us and showed us how to safely navigate within the crevasse chambers. 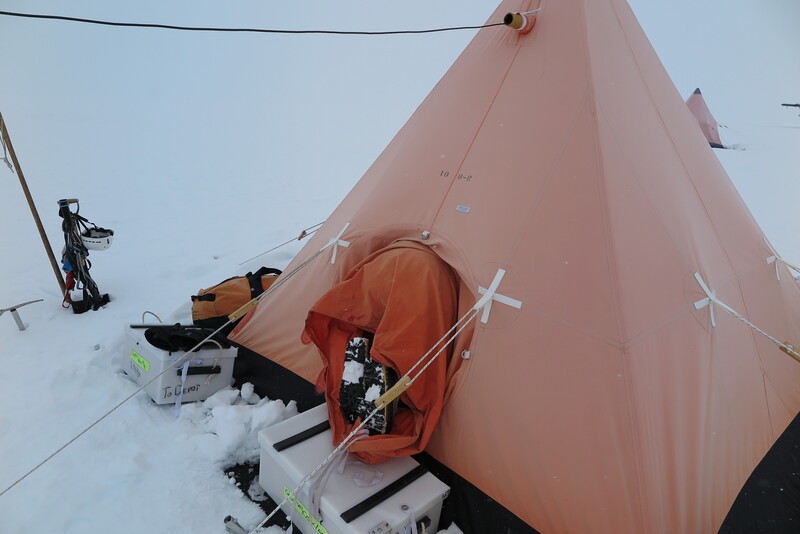 The crevasse has been laid with guide ropes to which we attach. 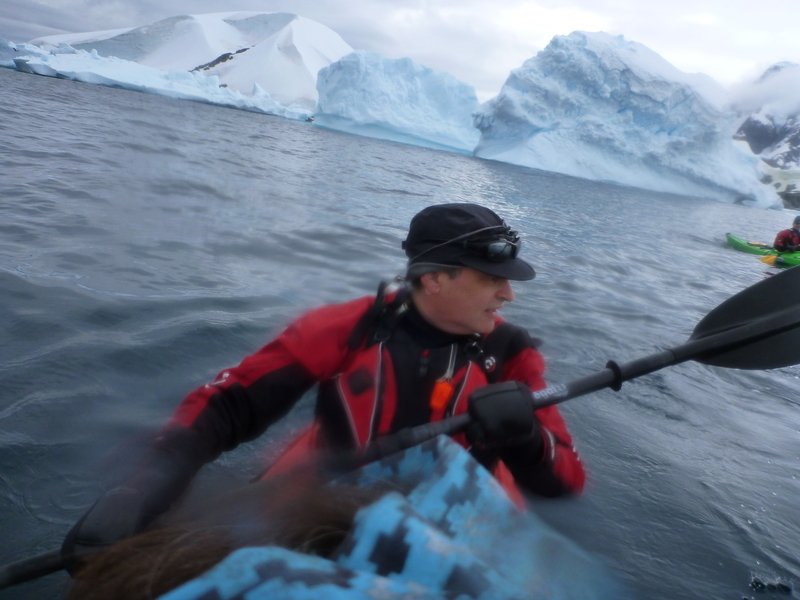 Always attaching a row before detaching from a previous rope. 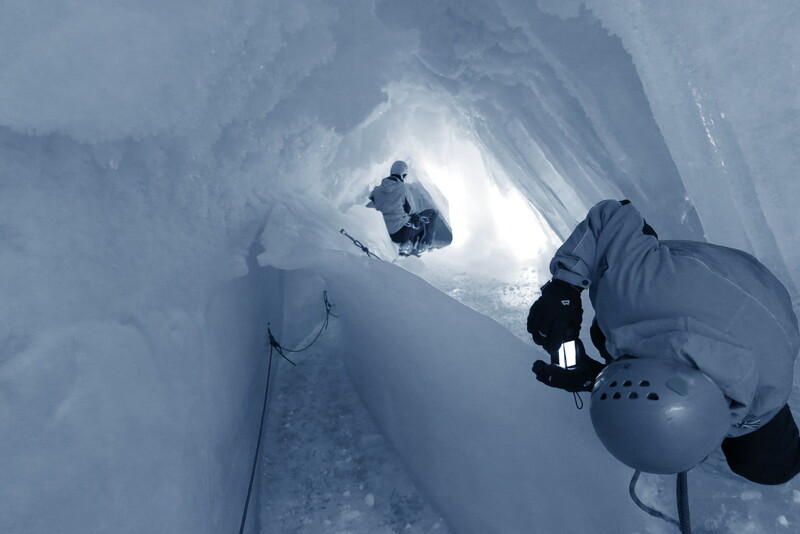 With this system we were to and were able to navigate the crevasse at our leisure. For the most part, my first week has been spent learning the BAS standard operating procedures and flight following phraseology. 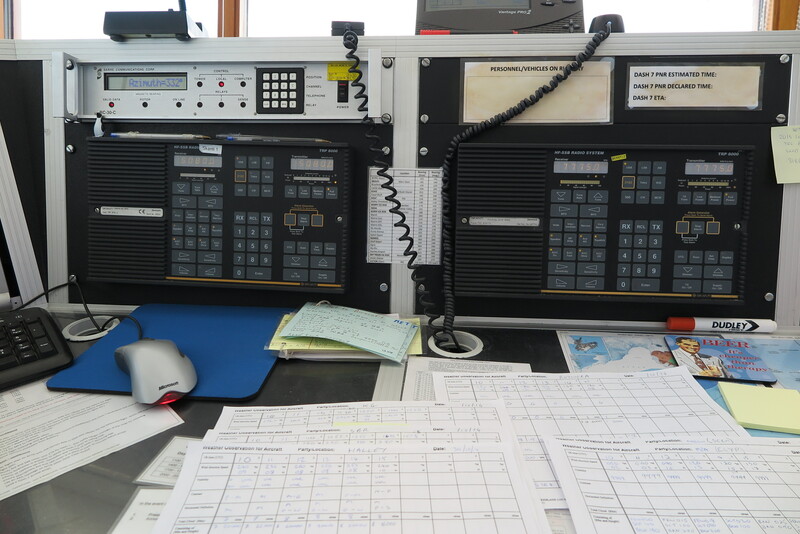 The HF radios are the main means of communications with the aircraft. 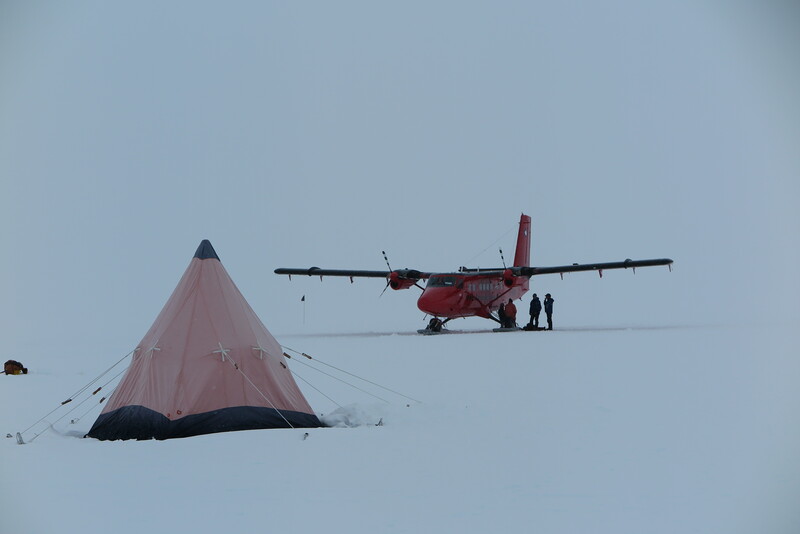 that the appropriate stations are in place to provide fire cover, boat rescue cover, sea ice rescue and runway PAPI lighting checks. The Standard Operating Procedures (SOP) provide the criteria and actions for all flight following procedures. 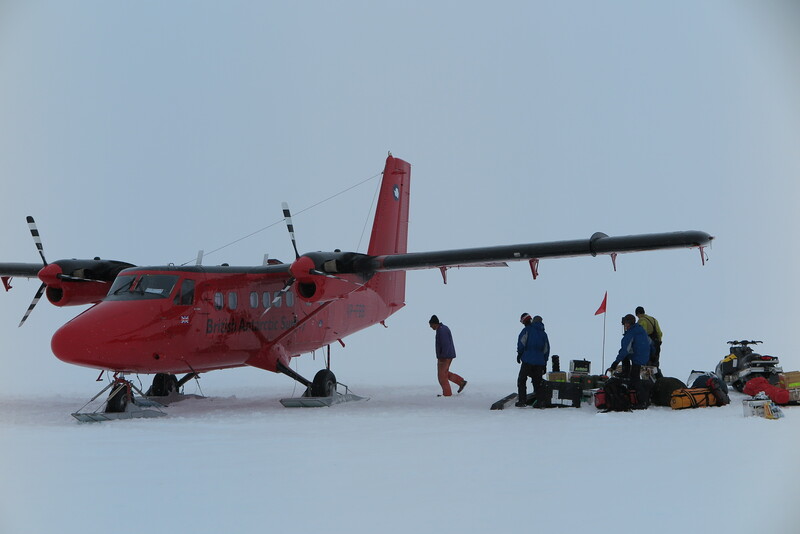 For an aircraft departing from Rothera we refer to the SOP to ascertain the SAR cover requirements for the flight taking into account the current conditions, the aircraft ferry weight and POB. 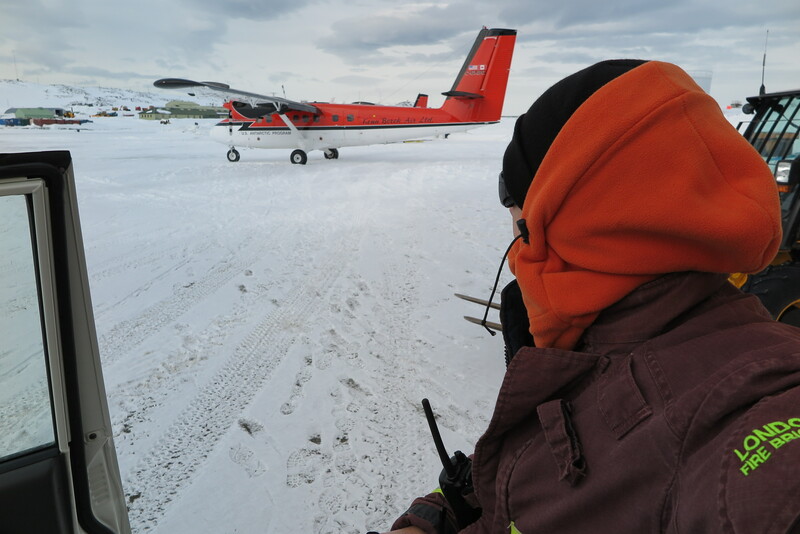 Various internal calls on the base telephone or VHF ch1 are then made to check that appropriate, fire cover, boating SAR cover, and sea ice parties are in place to provide SAR cover for the flights take-off. 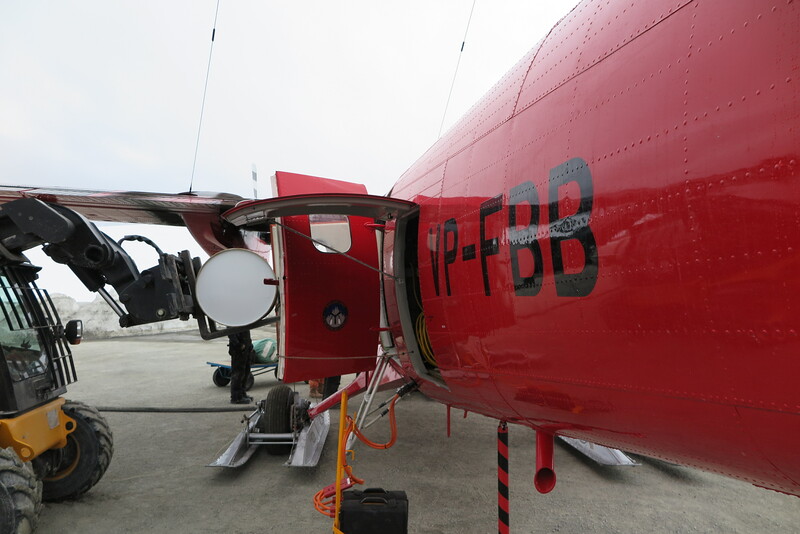 Once the aircraft is powered on the first call from the aircraft will be a request for radio checks on both VHF and the various HF frequencies that may be used throughout the flight. The radio check frequencies and readabilities are noted on the first entry in the flight following log for the flight. The next call from the aircraft will be a request for the latest aviation weather reports. In this message we will pass the latest hourly weather from every airfield or field station en-route for both the planned flight and the alternative destinations. 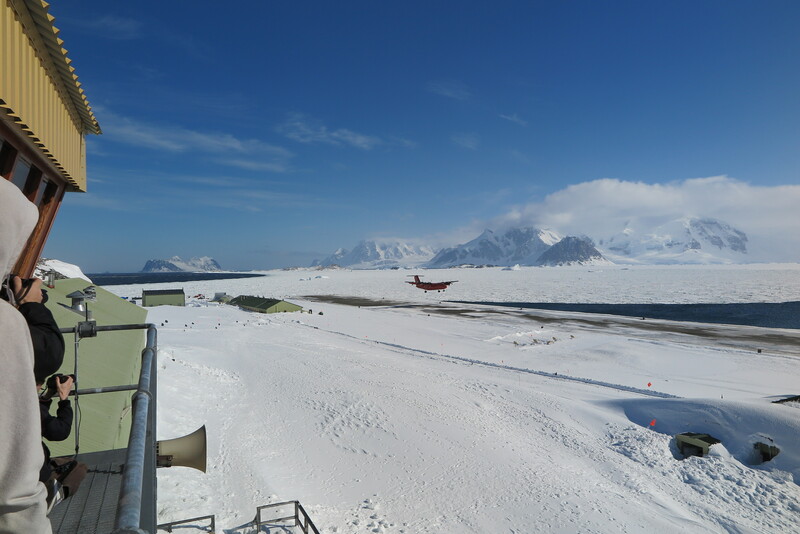 So for example for a direct flight from Rothera to Punta Arenas we would pass the latest weather for Rothera (EGAR), Redolfo Marsh (SCRM as alternative) and Punta (SCCI). The next call from the aircraft will be the taxi call. This message will include the aircraft callsign, runway number, flight destination, POB and fuel endurance. We respond to this message by reading back all of the information and then passing the latest runway and area wind speeds and direction and the latest runway QNH (pressure) to the aircraft. At this point we log all the details on the flight following log, turn on the runway siren, warning, lights and beacons and make an all stations announcement on VHF CH1 to announce the departure of the aircraft. Once the aircraft has taxi-ed and lined up on the runway, the next call from the aircraft will be the callsign and rolling call. We simply acknowledge this call by reading back the callsign and replying with roger. As the wheels leave the runway we log the airborne time on the flight following logs. Once the aircraft levels off the pilot will call airborne. Once this call is received we respond by providing the airborne time from the FF log to aircraft. At this point we turn off the runway sirens lights and apron beacon.